I did it! I took the plunge and added my name to the list of participants in Art Every Day Month at Creative Every Day, a website that encourages its readers to "be an everyday creative and be creative every day". During the weeks of my Flying Lessons course I was so focused on learning from Kelly Rae Roberts how to build a creative business that I didn't have time to actually create much. Now I'm ready to get back to making art and I hope this challenge will help me stay focused and productive! Since I like to work on blog posts first thing in the morning I will post each day's project the morning after I create it. So, without further ado, I give you yesterday's project...a chandelier crystal collage necklace. I was in the mood to do a little wire-wrapping, so I put this piece together using a mixture of stone and Czech glass beads, leather, and hand-made findings. 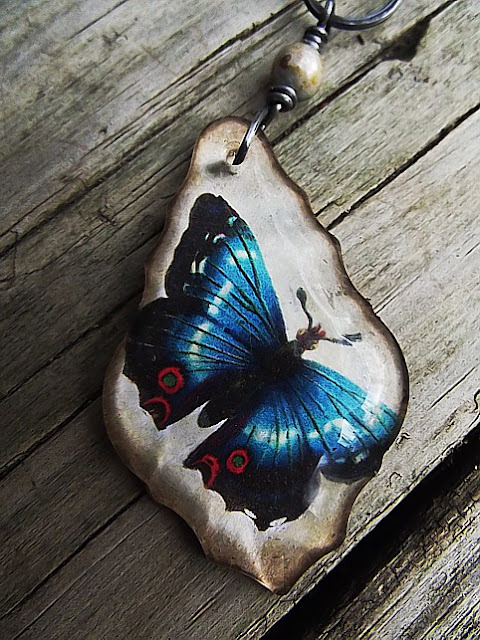 To make the pendant, I antiqued a blue butterfly image with a brown ink pad and affixed it to the back of a chandelier crystal using heavy gloss gel medium. After forming the connectors and clasp from anodized steel, I hammered them for strength and polished them for a little extra sheen. The steel looks a lot like oxidized silver to me. It's a little harder to work with, though, as steel is not a very pliable metal. It seems that I've focused my studio time mainly on collage and art-journaling lately. It was great to make jewelry today. The pliers and wire felt good in my hands. Sometimes I think my favorite medium is simply the one I am using at any given moment! Thanks for having a look. Hopefully I'll get a few pieces together and reopen my Etsy store in the next few weeks. I will definitely let you know when that happens. This necklace may be the first new item I list! Have a happy, creative Monday! Thanks, Anoeska! I had fun making it! how strange .... my entry today was jewelry after I've basically ignored my jewelry space for a long, long time. I forgot how relaxing making beaded chains can be. Love, love , LOVE the pendant! Thank you so much! 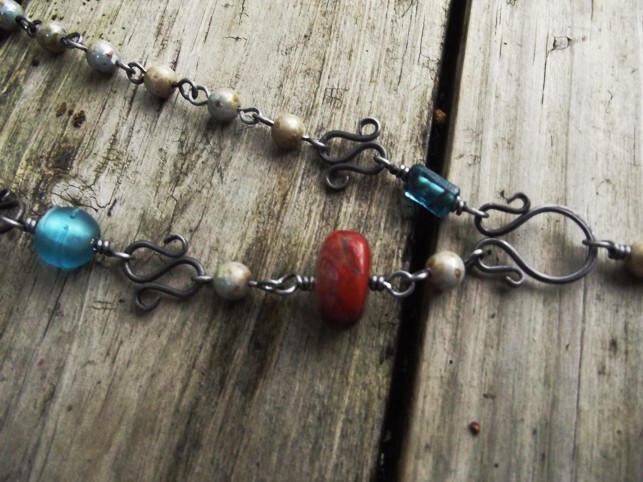 I am working on jewelry again today...looks like I'm on a roll. Looking forward to seeing your future AEDM posts! Thanks, Julie. I'm really excited to be taking part in AEDM! Love the necklace and thanks for sharing how you made it. Thanks for stopping by. It's so nice to be able o share my art with some new friends. Thank you and thanks for stopping by! I just popped over to see your blog. Love it!